Cherry Mobile Omega HD now official, priced at Php7,999 (SRP) only! The HD is here! Cherry Mobile has finally unveiled at the Diamond Hotel in Manila their first-ever Android smartphone with 720p HD display called the Cherry Mobile Omega HD, also known as i-mobile IQ 6 in Thailand and the successor to the two-month old Omega. For only Php7,999 (SRP), the Omega HD boasts a 5-inch 720p HD IPS display with Dragon Trail Glass (scratch-resistant and can be used while wearing gloves), 1GB of RAM, 4GB of internal storage, 12MP BSI camera with LED flash, 2MP BSI front-facing, 2,100mAh battery and runs Android 4.1 Jellybean. More about the Cherry Mobile Omega HD specs and features after the jump. "We value the lifestyle of Filipinos that's why we come out with smartphones in every range, with different specs. We started in 2009 to bring in the products that you see right now in the market. The products range from the very basic phones up to the WiFi feature handsets, and now we're bringing in smartphones." - Mr. Lonson Alejandrino, Cherry Mobile's Product Manager for Smartphones. 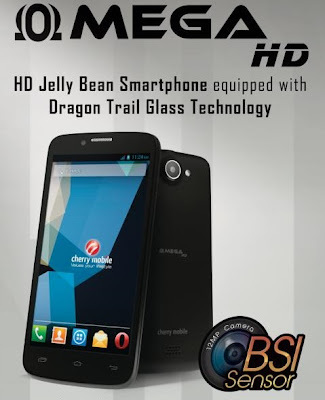 What is Dragon Trail Glass Technology? Dragon Trail Glass Technology is an alkali-aluminosilicate sheet glass manufactured by Asahi Glass and engineered for a combination of thinness, lightness and damage-resistance, similar to the Gorilla Glass by Corning Incorporated. The material's primary properties are its strength, allowing thin glass without fragility, its high scratch resistance and can be used while wearing gloves. Some of the specs of the Cherry Mobile Omega HD is still not available at this moment. We'll update this post once we know more about the specs of the device, so stay tuned! 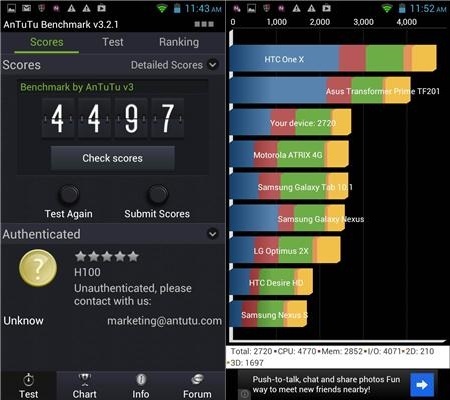 I am rather disappointed in antutu benchmark score. Fusion Bolt scores about 5k+ though. Sa ngayon hindi pa naman ako nakagamit ng Cherry Mobile Android Phone, if you compare CM vs Starmobile which one you will recommend? Yong omega HD 2.0 quadcore na siya. how come ang baba ng antutu benchmark nyan? Dual core yan it's supposed to get 6.5k above? Sana din wag ng husgahan ng tao ang Cherry mobile. ang starmobile magla2bas ng diamond na halos parehas lang ang specs ng omega hd tapos kulang2 10k ang price... ano ba yan over price naman masyado parehas lang naman kayo ng pinagkunan ng brand....ang omega hd 7,999 lang katumbas lang ng crystal ng starmobile...tsk..tsk...tsk wla ng bibili ng crystal at flirt nyo kung di nyo ibaba ang price nyan......naku naman tlga.....tsk....tsk...tsk. bakit kaya ang baba ng Antutu Benchmark score ng Omega HD? PS: Sorry I’m not too techie to understand Antutu benchmarking, especially how the CPU and the screen resolution affects the score. Sabi po nila sa 168 Mall sa Binondo meron na, sa SM North Flame 2.0 pa lng ung available. Mga boss, sino na nakatry sa inyo using this phone? Kaya ba nya iplay ung Frontline Commando without lags? meron n po b starmobile diamond? may alam po ba kau na local brand na 4G LTE capable? Wala pa po local brand na meron 4G LTE. this is a big step for cherry, i hope by this year gumawa sana sila ng full HD, a 2gig of ram and yung cpu kagaya ng CM flame2. how come kaya ng cherry na mag launch ng Flame 2.0 na quadcore? sana naman itong HD na to ay ganun din. khit mas mahal lng kaunti atleast sulit na ung speed. wat do you think sir adrian? im about to buy titan na sana, then i saw this thread. nakuuuuu :) buti nalang, im now waiting for more videos and threads regarding this unit. super sulit to :) . I want oneeeee! Haahaa. The long wait is over! sna quad core to pra perfect na.. haayz my phone a919i duo vs. cm omega hd vs. cm flare 2.0 vs starmobile diamond...?? peru sir adrian.. void ang warranty pag nag tweak? Kapag malaman po nila, ma void yun. Dami kcng running apps sa bg. I think the lowest score n mkukuha nyan is mga 6.5k. My flare's highest score was 6840 the lowest was 6515.
kung starmobile kaya nakapag rebrand nito magkano kaya magiging price? at android devices around the world : http://en.wikipedia.org/wiki/Comparison_of_Android_devices.... "at sa lahat ng naniniwala na ang cherry mobile ang nagrerebrand lng di po yan totoo pakibasa nlang po ng mga links na pinost ko patunay po yan".. sa susunod wag ka mang husga, alamin mo muna tanga !!! Parang ang sikat na sikat ng CM Flare ay rebranded lang po ng Karbonn A9+ from India. At CM Flame which is Karbonn A21. Basa basa ka nalang po. Baka makatulong sayo. Peace!